Take a spirited journey with an expert historical guide through the shadowy streets of the French Quarter as you learn of ghosts, gris-gris, Voodoo, and Witchery and discover why New Orleans is the World’s most magical city! 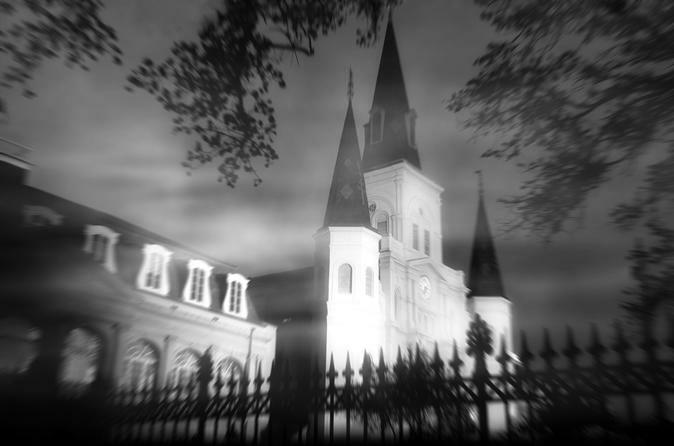 Our guides will bring the spirits of the French Quarter alive with true stories of our haunting past! Explore the legacy of New Orleans Voodoo—a mysterious faith born in the Crescent City. Learn of Voodoo dolls, potions, and the legends of Doctor John and Marie Laveau! Learn of our deep history of European Witchcraft and folk magic, and the powerful practitioners who engaged in these forbidden arts! Few tours have access to our city’s beautiful courtyards, but we end ours with a powerful blessing in the enchanting brick courtyard of Hex! Your tour begins at Hex, a Witchcraft shop located at 1219 Decatur Street in the historic French Quarter—just steps from the popular French Market. Be sure to arrive a few minutes before 7pm so you can register. You will then join your guide on a leisurely walk through the Quarter as you visit haunted sites, learn of voodoo, magic, and more—and there's a stop for a bathroom break and maybe a cocktail (not included), since New Orleans is known for those spirits as well—and you can take it with you in one of our city's famous "go cups!" The tour ends back at Hex where you'll visit one of New Orleans enchanting and mysterious courtyards—something many visitors never get to see—as you participate in a Witches blessing for health, wealth, romance, and protection.